Born in Nagpur, in 1953. He graduated in science from Kanpur University in 1973. Well known for his cross hatching technique, he has been around for the last 40 years. 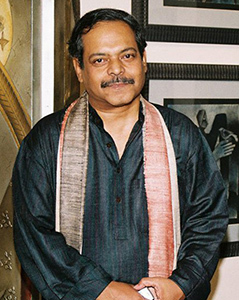 A self taught artist with high social commitment and strong views, Ashok has shown marked, stylized and inimitable form. He believes in a simple and unburdened communication through his works that makes him popular among a wide range of art lovers. Ashok Bhowmick lives in Delhi and actively engages himself in sculpting in Bronze too. 'Four Contemporary Artists from India' at Hamail Art Gallery, Lahore, Pakistan, 2005. National College of Arts, Lahore, Pakistan, 2005. Delivered a lecture on 'Commercialization and Contemporary Art' at the Department of Paintings at Allahabad University, 2006. Attended the international seminar on 'Gender perspective in Asian Art' on the occasion of Asian Art Festival in 2006, Dhaka, Bangladesh. Evaluated the merit to select the awardees from the paintings submitted for the All India Exhibition, 2007 organized by State Lalit Kala Academy, U.P. Member of Jury for the All India Exhibition, 2007 organized by Kalidasa Academy, Ujjain, M..P.
Lecture on “War Paintings” at Indian Institute of Mass Communications New Delhi, 2nd Lucknow Film Festival, Instituto Cervantes (Spanish Cultural Centre) New Delhi and many other cities . Lecture on “Paintings of Rabinrda Nath Tagore” at Vikram University , Ujjain , Law Bhawan , Chandigarh , Bharatiya Jnanpith ,Technia College of Arts, Teen Moorti Bhawan. New DelhiDelhi, Press Club , Indore and at the CHAUPAAL. Mumbai.